The front of the Alamo is instantly recognizable; almost like a stage set. Everybody knows the bed-stead outline with what would have been a pair of towers on either side, a pair of shell-supported niches on either side of the door ... were there ever statues in those niches? I've always wondered about that. It was a mission church, when first built, then a chapel for the Mexican Army garrison, and at some point the roof over the nave and sanctuary collapsed in. When the Alamo achieved fame everlasting, in the space of 14 days and a murderous hour and a half of pitched battle on a dark April morning, the church building had made into a bastion, filled with a platform and a ramp of packed earth and rubble to make a gun-platform for three cannon at the apse end. Later, it was repaired, and re-roofed, serving for decades as a US Army garrison and warehouse, as what was left of the mission compound was torn down, and the town of San Antonio de Bexar crept closer and closer to the old mission buildings. Eventually, the Army decamped to a new-built compound a little way north of town, and the old chapel became a shrine again. 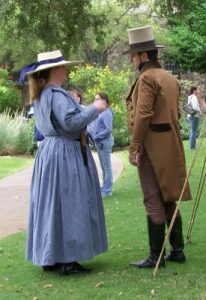 What hardly show in the usual pictures are the trees and gardens on either side, and in the back, which served as a backdrop for the San Antonio Living History Association's "Fall at the Alamo" last weekend. My daughter thought there would be quite a few more re-enactors than there were - and as it turned out, I was much more interested in the re-enactors who had demonstrations and talks about early Texas than she was. he was enchanted by the lace-making demonstration, by two ladies who were hand-making thread lace, weaving thread from dozens of slender ivory or wood bobbins, each bobbin trimmed with a bauble of beads. 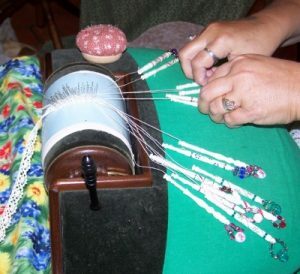 The lace pattern was mounted on either a pillow or a little round drum, studded with pins in a precise pattern, and the threads were woven around the pins and twisted with other threads - it was fascinating to watch. 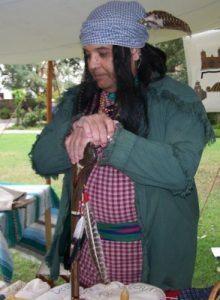 There was a spinner, with a basket of hanks of yarn, dyed with natural dyes, all in very muted shades, including a pink made from cochineal ... which according to another re-enactor, dressed as a Delaware Indian, was one of Texas's main exports, in the early days. He actually had a bottle of cochineal insects, little grey-whitish scale bugs that feed on cactus plants. When dried and pulverized, a red dye is extracted from these little insects, a red dye which takes superbly to wool. 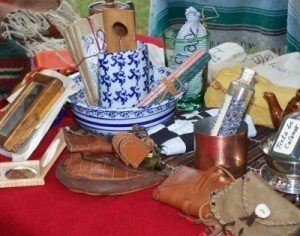 He had a table full of samples of commodities harvested or produced in Texas in the early days - by early, meaning Republic of Texas or earlier. Some of them I had already known about - like pecans. And leather goods, rice and salt. I think very fondly of re-enactors when I am working up a book; there is no better way to get an idea of actually how something was accomplished, like starting a fire from flint and steel. Another re-enactor showed us how - not just with a chip of flint rock and what looked like a link from a steel chain, but also with the aid of a little scrap of carbonized cloth to catch the spark, and a wad of vegetable fiber - from, of all things, a mouses' nest - to feed that little spark and nurse it along. I would have never thought of that, so accustomed to using matches or a lighter in these days. 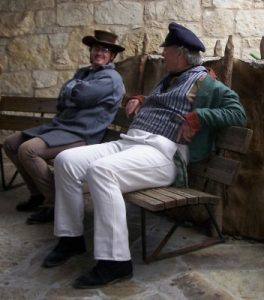 I am sure that other San Antonio Living History events will be just as interesting, and spark any number of other insights - in me, and in anyone else.